I spend a fair bit of time away from home (and I talk about some of my travel must-haves here), and being away so often makes my time at home that much more precious to me. I struggle sometimes at making it a haven where I can kick back and relax (between what seems of endless loads of laundry–I’m just one person but between delicates, regular clothes and workout clothes, it piles up!–and constantly unpacking and repacking luggage, gah!). Because I’m working out regularly, I shampoo my hair often. Which can dry out hair, but I use Aveeno® Positively Nourishing Moisturize Shampoo and Conditioner so that my hair doesn’t get stripped. These two products are made with a formula of gentle moisturizers and includes a nourishing Wheat Complex and Oat Protein so my often over-shampooed hair maintains shine and strength. I usually don’t travel with these products (in order to save space in my luggage — carry-on only whenever possible!) and I notice the difference in how much more manageable my hair is once I return home and use these products instead of whatever was in my hotel room. While I typically wear a higher SPF, during cooler months where I’m typically indoors for more time, I love to use Aveeno® Positively Radiant Daily Moisturizer SPF 15. With its Total Soy Complex and natural light diffusers, it helps with my uneven skin tone and dark spots, and I like that it’s hypoallergenic and non-comedogenic. It is lightweight, though, so in the winter, I use a heavier night cream or an oil to give my dry skin (which gets exposed to harsh winter elements since I run outside all winter) more of rich dose of hydration. As for my body, I’ve always been prone to dry skin, so with my skin recovering from winter and my frequent showering (often twice a day because of (1) life and (2) regular workouts), hydrating my skin well is actually the thing I’m most diligent about when it comes to my beauty routine. If I were to skip this step, I’d be scaly as a snake and itchy AF. 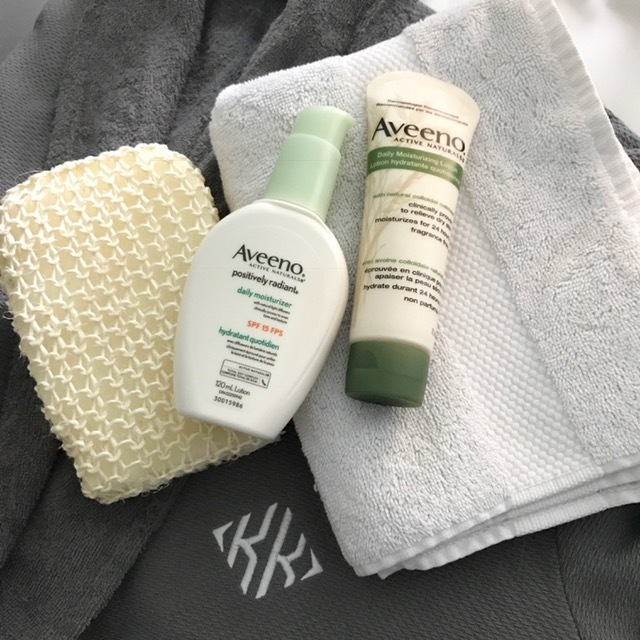 So, in order to NOT be in such a state, I slather on the new Aveeno® Eczema Care Itch Relief Balm, which helps strengthen the skin’s natural moisture barrier and moisturizes skin well. It’s not greasy, and is gentle enough for daily use. Plus, I love that it’s in a large pot (it drives me crazy when pump dispenser’s stop pumping out lotion when there’s so much left in the bottle!). Where I can slack off with my moisturizing routine is when it comes to my hands. Did you know–your hands are the first part of your body to show serious signs of aging?! So, I keep a tube of Aveeno® Daily Moisturizing Hand Cream on my office desk so I can apply it when I’m working on my computer. I remember Aveeno® being on the bathroom shelf when I was growing up, actually, so it’s been a trusted staple on my bathroom shelf for practically my whole life, come to think about it.